The Lumenis VersaPulse PowerSuite is an expandable and upgradable surgical laser system that can handle almost any kind of surgical procedure. It is available with a holmium laser or Nd:YAG laser, or a combination of both. The VersaPulse system can be used for surgical procedures including urology, gastroenterology, orthopedics, ENT, thoracic, pulmonary, gynecology, podiatry and general surgery. 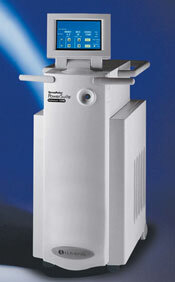 No other surgical laser system is as versatile or powerful. The Lumenis VersaPulse PowerSuite is available in a variety of configurations, including 20 Watt, 60 Watt and 100 Watt with a single holmium wavelength, or an 80/100 Watt model with dual wavelengths for holmium and Nd:YAG. UsedCosmetic.com can help you determine the best model to fit your needs, and we can also get you the best price on a Lumenis VersaPulse system. The Lumenis VersaPulse PowerSuite is one of the best surgical laser system that you can buy, that doesn’t mean you need to pay retail price. At UsedCosmetic.com, we sell refurbished VersaPulse systems for up to 60% off list price, and we only sell equipment that has been professionally reconditioned and inspected and we always provide a full satisfaction guarantee. If you want a fast quote on a Lumenis AcuPulse CO2 Laser with no obligation, just fill out the contact form below. We’ll respond back with the best price on this system.